It’s done and over and soon a new journey will take place. This journey was unlike anyone these eyes has ever seen. A great kid and great family, fighting for acknowledgment. A young lady showing that anything is possible on and off the court, she is special. It has never been easy for LOLA MULLANEY as she has been doubted every step of the way, despite her accomplishments on and off the court. We have seen her mastery on the court. We just didn’t know how masterful she was off the court. In the song the Mack, their is a line which reminds me of LOLA… “you went and broke my heart, so I had to come back strong, I HAD TO DOMINATE to show you we’re wrong” Lola Mullaney has had her heart broke so often, it’s unreal. But yesterday she found love true love. She surprised us all and chose to attend one the best schools on planet earth …HARVARD UNIVERSITY. The brinks job Harvard University pulled off yesterday was one of the biggest heist in Shore history. One of the best schools in the country got for my money the best player in New Jersey. It’s not everyday you sign a player that you believe one day will the “player of the year” in your conference. Harvard knows something special has just happened. They know they just got a little closer to U PENN and Princeton. They know they just did one of the best recruiting jobs in the country. They had to beat all those schools with famous names across their chest. 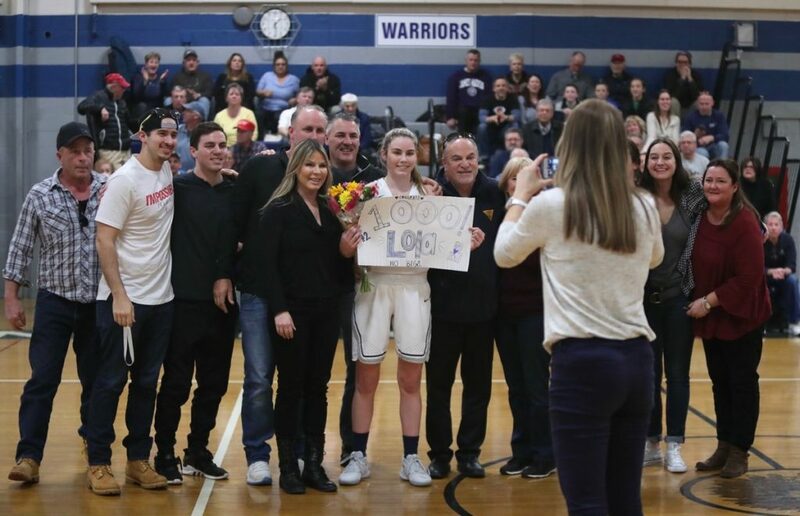 They were able to do this because LOLA MULLANEY never even entertained the thought of giving up something on the educational side just for basketball. She never cared what others thought. She was mature and she knew where she would go to college, would be a life changing decision. 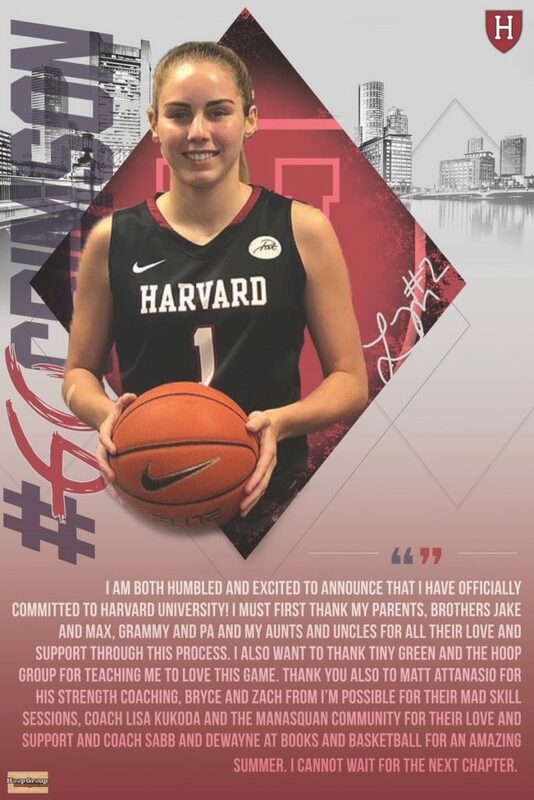 We just didn’t know that she would pick the grand daddy of all schools HARVARD….and if you ask me, Harvard never dreamed a day like this could come true..
To understand LOLA MULLANEY, you must understand, she has been fighting her entire career to be acknowledged as one of the best. When she was a in coming freshman she was not listed as one of the top players in the freshman class by me or anyone else. Yet her freshman, she was named to THE HOOP GROUP ALL FRESHMAN TEAM. When she transferred to Manasquan, I told her to be very careful and it may not be such a good more. She didn’t care and transferred to the powerhouse. Despite clearly being one of the best players in the conference, she came off the bench. She never complained and personally beat RBC twice to save the Manasquan season. But once again Lola Mullaney was not treated with the respect a superstar deserves, who has delivered when it counts most. 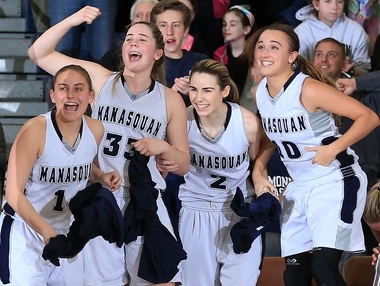 Last season Lola Mullaney was a beast and helped Manasquan to a TOC and SCT title. But she seemed to never get her due. She was a true victim of politics. It’s seemed nothing she could do was good enough to take the spotlight. If she was the leading scorer in a game you never read about it. You never read that she was the best rebounding on guard in the state. You never read she was rated the 16th best wing in the country by ESPN. It’s hard to find one word quoted by anyone regarding Lola Mullaney. She has had to live with such disrespect so long at every step of the way…but not now…now she is off to a place everyone respects… HARVARD UNIVERSITY. It takes a lot to break Lola Mullaney, her skin is like mental. Her mental toughness is something out of a super hero novel. Last year it was all tested after the season. When the All State Teams were announced Lola Mullaney name was nowhere to be found. When the All Shore First Team was announced..no LOLA MULLANEY. She knew it was a game of politics. She knew, her stats were better than the others. She knew, her teams record was better than others. She knew, she made more big shots and plays than the others. But she is use to being dismissed and put aside for others. She understood that’s way things work and they didn’t work for her, the same way it did for others. But what really hurt her most was when THE HOOP GROUP ALL SHORE TEAM came out. The man who talked so often about his dislike for politics, did just that. When I left LOLA MULLANEY off the All Shore First Team. I was playing a bad game of politics. I think I know why I did it, LOLA MULLANEY, I knew could take the slight directed at her. She has been slighted every step of the way, so why should this be different. But it was different because Lola Mullaney never believed I would play politics, knowing and seeing all she has been though and knowing how hard she has worked…but all that doesn’t matter today..because she is off to HARVARD and nobody can question the greatness of that!!! Lola Mullaney has a brother that plays football at Columbia University. It’s clear brains and athleticism run in the family. Only 6% of the applications are accepted at HARVARD, so Lola Mullaney has had to work very hard to join that 6%. But she knows not to get it twisted because she got her work ethic from her dad. You see nobody works harder than her father. Ask anyone who knows this man, he has built a successful business by just out working the world. Her mother is a no nonsense woman. She expects her children to do their best. She also is the most direct truthful persons, you will EVER MEET. Lola has parents who get it. They have never allowed Lola to settle at being 2nd best. 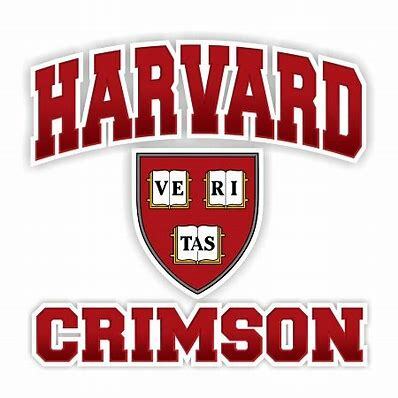 They have given Lola a expectation of greatness in everything she does…hence HARVARD UNIVERSITY. What is Harvard getting? The best player in New Jersey, I say this because it’s true. I say this because she brings everything to the table. She has a unheard of work ethic. 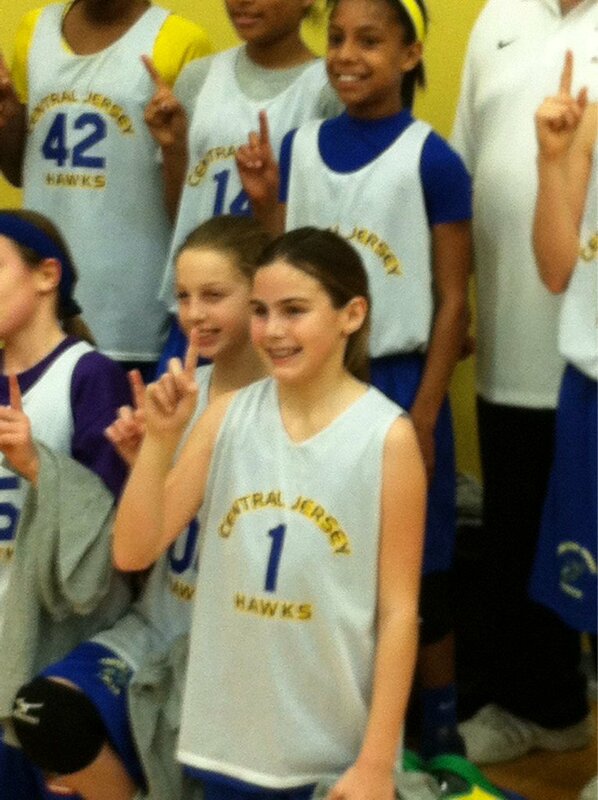 She may be the most coachable player in New Jersey. She is willing to play any role for her team. She is well liked by all, while being a mentor and role model. She is insanely talented with skill sets that are off the charts. There is not one phase of the game she does not excel at. Her length and athleticism are only matched by her IQ. She is ego free and the best teammate you could ask for. Harvard is getting an ELITE person, family and student. They are getting somebody that will die before giving up. They are getting a mega competitive player. Harvard is getting a big shot maker on big stages. HARVARD UNIVERSITY proved Anything is possible…..like getting LOLA MULLANEY. Where do I start when talking about Lola Mullaney. First I known her since 3rd grade. A skinny little girl trying to learn how to make left hand layups. 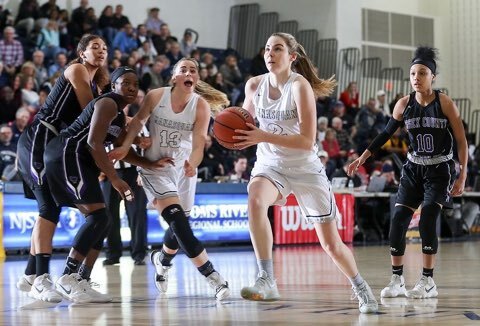 I know, I’ve never coached a kid as hard as I did Lola Mullaney. But I also knew she was special from day one. Hey parents, let you push her and hold her accountable. They always had your back and trusted her coaches. I’m most proud of Lola and her parents, when as a sophomore it was clear they could have made things messy at Manasquan and didn’t. They took the high road, when she was coming off the bench. It had to take real strength by the entire family. It’s funny but I don’t expect one thing in the papers today about MULLANEY ‘S decision. She won’t get the same love other got, when they picked a college. They’ll be no quotes, pictures or acknowledgment. It’s just the way it’s been for her. 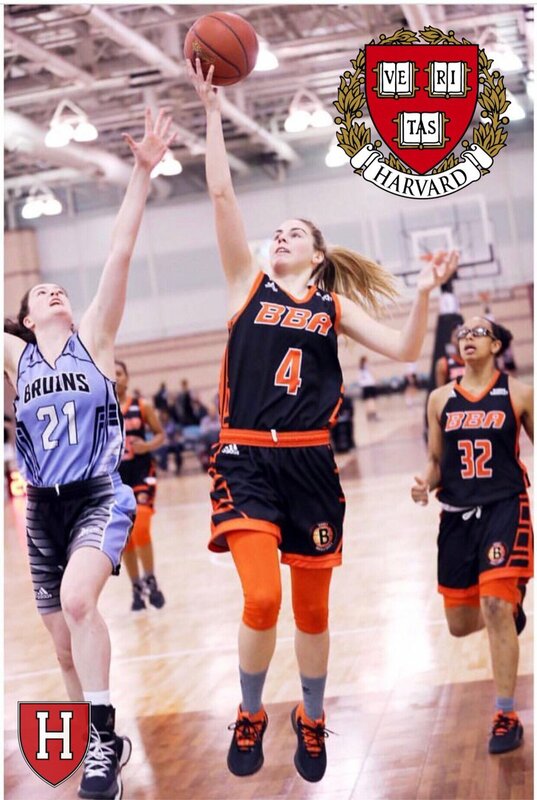 I almost thinks she expects it’s now..but Jesus she going to HARVARD UNIVERSITY….This summer Books and Basketball really helped Lola Mullaney…they did right by her. They knew she was special and wanted the world to know this. I think Lola found the perfect AAU Team this summer. 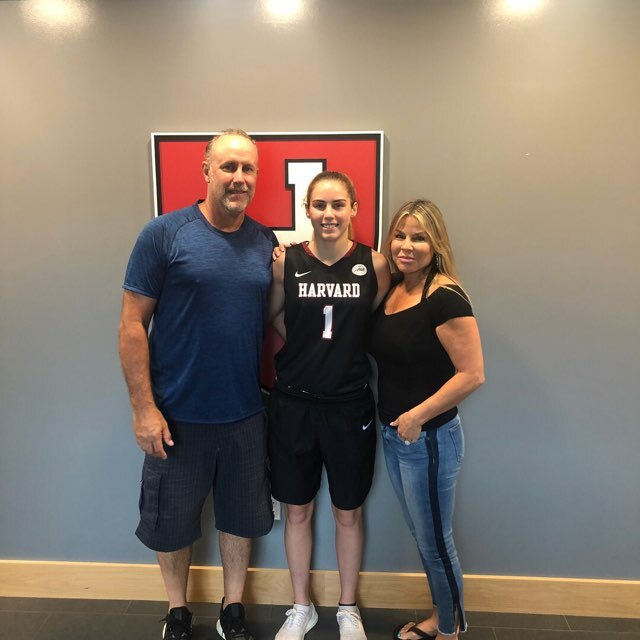 Elite Competition, good teammates and a organization and coach that she could trust…just like HARVARD UNIVERSITY….I’ve never had a Harvard hat. But I can tell you, I plan on wearing it often. Just to remind kids….ANYTHING IS POSSIBLE. ← Brelynn Bellamy/WILLIAM AND MARY….what’s not to like?